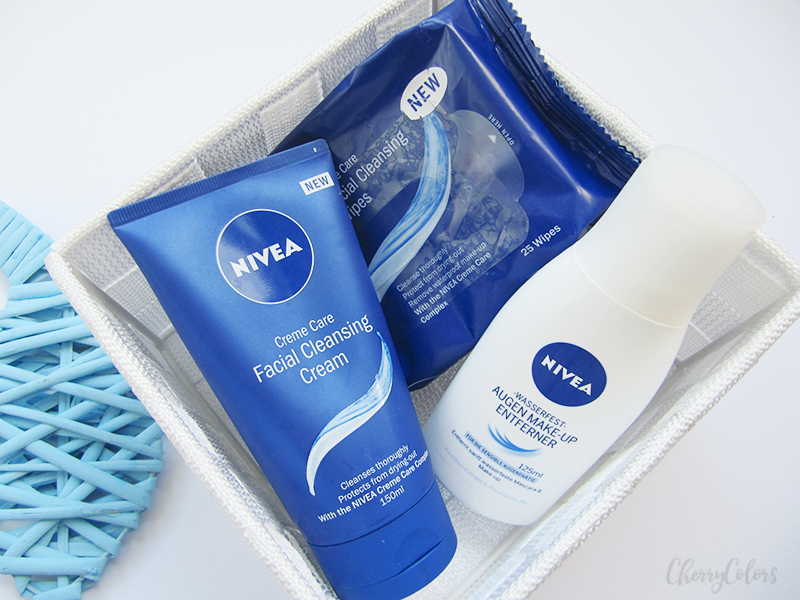 My cleansing routine with Nivea - 3 products that make the difference - Cherry Colors - Cosmetics Heaven! Today I have a quick post for you all - my cleansing routine that changes from time to time, but this time, I'm sticking to it until I can. Why? Because with just 3 products, my skin went from super dry (even flaky at times) to normal and happy. These products are the ones I use for my night routine - removing my makeup and cleansing my face. NIVEA® Daily Essentials Creme Care Cleansing Wipes removes make-up and even waterproof mascara with one facial wipe. The wipes protect the skin's natural moisture balance and prevents drying out. The caring formula with Eucerit® and Panthenol is suitable for all skin types. At first use, these did burn my undereye area, but it must have been because my skin was so damaged from all the rubbing - I used vigorous rubbing to remove my makeup with these wipes. But once I started being gentle with them, there was no more burning sensation around my eyes and now I use them to remove any makeup I have if I am in a hurry. NIVEA® Daily Essentials Creme Care Cleansing Cream Wash enriched with skin caring ingredients from NIVEA has a caring formula that leaves the skin feeling clean and soft, looking naturally beautiful. This is a very creamy product which I like. Usually, facial cleansers dry out my skin, but not this one. Of course, the drying out doesn't happen overnight but it takes several days to happen. Luckily this cleanser is different and I don't feel my skin tugging after each use. It cleans off makeup nicely even the waterproof makeup and leaves my skin happy after each use. I also like the classic Nivea scent it has. So many memories! The water-resistant eye make-up remover with chamomile extract and provitamin B5 cleans the sensitive eye area and removes waterproof mascara and make-up : Waterproof Eye Make-Up Remover . I bought this product while I was searching for a good and inexpensive makeup cleanser to remove all my waterproof makeup. I found it in my local Muller and off I went. I use it to remove all my makeup and later finish my routine with the cream cleanser. It makes a great duo and doesn't irritate my eye area. I must say that I'm impressed with it - it actually has a milk consistency. Overall, this is a very gentle routine that I have incorporated in my skincare and I couldn't be happier. No more dried out skin barrier and no more pulling and itching of the skin after each wash! Did you try any of the products? If YES, what do you think of them and if NOT, which ones would you try? *Some of the products in this post were sent to me by the company or their PR. My reviews are always honest.